Here's the start of a 4 part sequence. A collaboration with John St Patrick. This has a potential "bad end" with Ranma and Usagi corrupting each other. The latter segments get pretty out there. The beginning is very nice. As to the end, and the steps getting there -- make it not so. [Yeah, in terms of style I rather like the "Sailor Drow" getup. [And bikini Ranma with her little sandals is also very cute. [But that was the intention, have the very first stages not be so bad. [To show why they'd even start, before the slippery slope went bad. Ellen Kuhfeld wrote: The beginning is very nice. As to the end, and the steps getting there -- make it not so. It's kind of like a puzzle from the Saw movies. How much can you witness before you go insane and gnaw your own fingers off from the awful? Following the string of pics on your DA left a chill going up my spine. [That's as indented. I wasn't kidding when I said this was a "bad end". 'Bad Ends' of this nature are things that intrigue me. The very idea of transformations going incredibly weird and leading to... problematic endings. I do like the very concept of the idea, which is incredibly neat and impressive as a whole. [Indeed. And the Return has such a potential for things to go very, very wrong that things like this are a possibility. [Though really anything with Sailor Moon and even a hint of Lovecraft can go pretty horrific. [Glad you like the idea! I had it rolling around for a while and (in addition to the pun on Ranma's name) it did seem like the way to have "Bliss" show how petty and possessive she had become. the end centarn form looks a little off with how short ranmas torso is though. talk about huge tracks of land though. not a bad set of pic though and kinda of amusing though. [Yeah, centaur torsos are a bit weird. I mean if you go with the actual length of a torso (hip bones going to equine shoulders) then the torso rises up really high from the horizontal back. But as you say having it shorter looks off too. [Heh. Well that kind of growth is expected with "bad end corruptions". [Even Bliss/Usagi got in on it. Which is probably why Ranma's got so large. [Thanks for commenting, glad you found it amusing. [I had the base pictures from Pat for a while, and had been trying to do some of the end parts of the sequence a couple years ago. It was only earlier this summer that I realized I had both halves and could actually build the whole "Bad End" sequence. [Amusingly, the first few steps were the ones I did last. 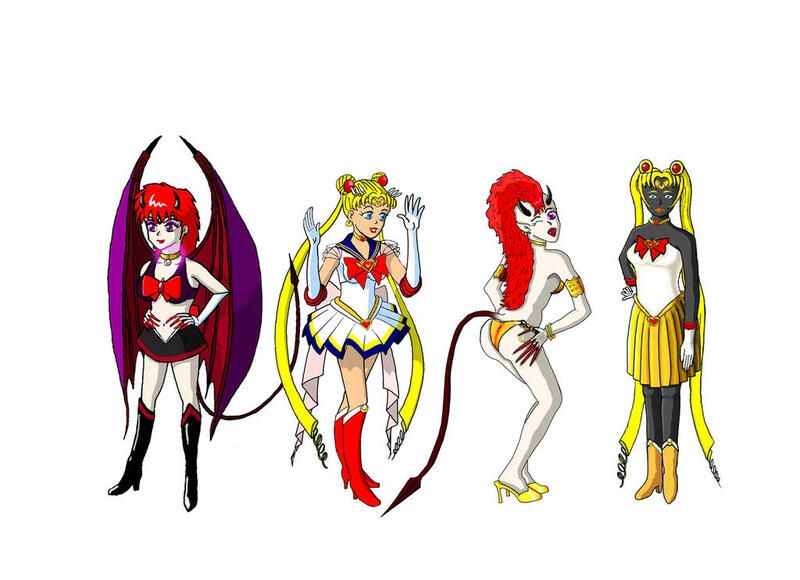 [And I kind of think the "Sailor Drow" one is the more interesting Usagi presentation.